Investigate a number of deaths along the Gold Road to obtain a recommendation from Anvil. Speak with Carahil to be sent to the Brina Cross Inn. Meet a Guild contact and get a room for the night, where you are later contacted in order to devise an entrapment. Travel along the Gold Road until you are attacked by the Rogue Mage. Return to Carahil and inform her of the events to receive her recommendation. Speak to Carahil at the Anvil Mages Guild to request a recommendation. Her task is to investigate a number of deaths along the Gold Road and put an end to it. You are to speak to Arielle Jurard at the Brina Cross Inn for more information on the matter. Before leaving, be sure to talk to Carahil once more - this time about the topic Rogue Mage - which will prompt Carahil to tell you the deaths on the road were caused by frost magic, and consequently give you three free Frost Shell scrolls, which do help as the rogue mage heavily utilizes frost magic. The Brina Cross Inn is along the main road a bit north of Anvil. Talk with Arielle, and she will suggest that you rent a room, posing as a traveling merchant. She will visit your room later. Christophe the innkeeper and possibly Caminalda, another customer, will ask you if you're a merchant. You can go along with Arielle and confirm to Christophe that you are a merchant, or say nothing. You must confirm to Caminalda that you're a merchant or it can lead to a bug later in the quest. Once you've spoken with them, head to your room and wait for Arielle - she shouldn't be long. Speak with her once she enters. Then rest in the bed (waiting does not work); even though your journal tells you to sleep till morning, a single hour is enough. After your rest, leave the inn and travel east. Outside the house, Arielle and Roliand Hanus, another Battlemage, are already waiting and will follow behind you. When you are attacked, the two will come to your aid and hopefully deal with the threat. Avoid using a horse, since it will be too fast for the Battlemages to catch up to. You'll soon run into Caminalda standing in the road, who will confront and attack you (if you didn't tell her you were a traveling merchant you might have to talk to her to trigger the attack). You can easily anticipate her attack since she is marked by the Quest Marker. She won't last long against you and your entourage, but you may find it difficult to attack Caminalda without hitting either of the Battlemages (if one of the mages summons a creature, be sure you know who it belongs to). If you attack Caminalda before she turns hostile, it will count as a murder/assault, but no bounty will be incurred. She will be carrying some potions as well as a key for her room in the inn, where there is some gold. Return to Anvil and speak with Carahil, informing her the murders have been stopped (topic Rogue Mage). With this you'll receive your recommendation and a +1 increase in Fame. This quest requires that you sleep, which may cause you to level up in the process. If you have proceeded far enough in the Main Quest, a Gate to Oblivion may open near the Brina Cross Inn, very close to the position where Caminalda confronts you. You may wish to make sure that no Oblivion Gate is present (or that the gate is closed) before trying to complete this quest. 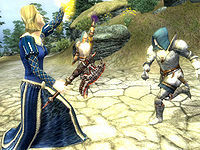 Having a swarm of Daedra interfere with your battle with Caminalda can lead to a hazardous situation and make it difficult to keep Arielle and Roliand alive. After you leave the inn, you can simply wander any way you wish and the mages will still follow you, allowing for two free, relatively powerful followers. Do not get a room before you contact Arielle. She will not talk to you until you go into the room and sleep - and there, she will scold you for not following orders. Unfortunately, if you haven't answered Caminalda's question about whether or not you are a merchant, she will follow you into your room too. This will prevent you from completing this quest. You can try getting her out of the room by simply running against her. You can correct this by opening the Console, and typing setstage MG04Restore 40. Tell Caminalda that you're a merchant. Otherwise, she will not try to attack you on the road. Entering setstage MG04Restore 40 into the console will correct this. If you get a room at the inn before you start the quest, you will not be able to get it for the quest itself because Cristophe will not take it back and it will be yours forever, thus making you unable to talk about being a merchant and unable to complete the quest, and thus unable to go any further in the Mages Guild questline. You can also try going to another town and paying for a bed at another inn. This will sometimes free up your room at the Brina Cross Inn and allow you to start the sequence again. If a guard is nearby when the battle begins, he will rush to join the fight, but depending on how he interprets the situation, he'll just as often rush to Caminalda's aid as he will yours. Luckily, neither Arielle nor Roliand have to survive for you to complete the quest, and even if the guard does kill them, usually Caminalda is already dead by then. 10 I need to speak with Arielle Jurard at the Brina Cross Inn, north of Anvil. 20 I need to rent a bed for the night at the Brina Cross Inn, while posing as a traveling merchant. 30 I have rented a bed at the Brina Cross Inn. I need to wait in my room for Arielle Jurard, and then spend the night sleeping in the Inn. 35 Arielle Jurard has instructed me to sleep at the Brina Cross Inn, then travel along the Gold Road towards Kvatch. 40 I've spent the night at the Brina Cross Inn. I need to follow the Gold Road towards Kvatch, and be wary of anyone along the road. 50 I need to talk to Carahil in Anvil and inform her that Caminalda has been defeated. 100 Finishes quest I have completed my task for Carahil. It is possible to use the console to advance through the quest by entering setstage MG04Restore stage, where stage is the number of the stage you wish to complete. It is not possible to un-complete (i.e. go back) quest stages. See SetStage for more information. Esta página foi modificada pela última vez à(s) 18h14min de 23 de julho de 2015.